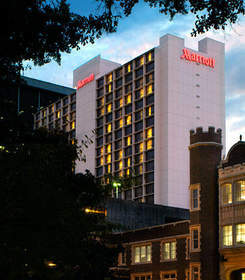 JACKSON, MS--(Marketwired - Jan 2, 2015) - Whether you are running or cheering for your favorite marathoner, let the Jackson Marriott be your race weekend headquarters. The 8th annual Mississippi Blues Marathon returns to downtown Jackson and will be held on Saturday, January 10th. The 2015 Mississippi Blues Marathon, presented by BlueCross and BlueShield of Mississippi, is not only a local Jackson MS tradition, but has also been selected as a Road Runners Club of America (RRCA) Marathon Championship race. The Jackson Marriott is the perfect location for all of your race weekend activities and is conveniently located along the marathon route. The downtown hotel is also near the Jackson Convention Complex, where volunteers and runners can pick up their race packets while shopping for running great and accessories from vendors around the country. On race day, there will be plenty of activities for all with the marathon, half marathon as well as a fun run for the kids! When the running is done, get off your feet and take advantage of the Bistro Restaurant and Lounge to relax, recover and share your race day stories with friends and fellow marathon runners. The Bistro Restaurant and Lounge feature contemporary America cuisine and regional specialties all on the grounds of the hotel, so runners can rest their tired muscles. For more information on the Mississippi Blues Marathon, please visit http://www.msbluesmarathon.com/. A quaint and fun hotel, this charming Southern hotel is a welcoming space for business travelers. Located in downtown Jackson, Mississippi only steps from government buildings and connected by Skywalk to the commercial business tower -- Regions Building, and near the Jackson Convention complex, Jackson Marriott makes commutes easy. With over 35,000 square feet of flexible event and meeting space, creative planners can make a truly memorable experience of the hotel's modern and urbane Southern aesthetic. Marriott's access to Jackson's cultural attractions will surprise even the most learned leisure travelers. The MS Museum of Art, the Old Capitol Museum, the Museum of Natural Science, the Governor's Mansion, and the Russell C. Davis Planetarium are just a few short miles away from this downtown hotel. All guests will love the convenience of Bistro Restaurant's contemporary American menu and regional specialties for a casual breakfast, lunch, and dinner, or the Bistro Lounge for a more refined dinner. The hotel's fitness center and outdoor pool are pleasant diversions from a day of meetings. Spacious working areas with high-speed internet access in the guestrooms allow for a productive stay among the relaxing atmosphere Marriott creates, while their signature Revive bedding makes forgetting about the rigors of the work day careless and easy. Stay at the Jackson Marriott for the MS Blues Marathon the weekend of January 10th.